Former LSU and Oklahoma State head coach Les Miles has moved to the top of the list of candidates for the soon-to-be vacated position at Kansas, according to The Athletic's Bruce Feldman. He tweeted this Tuesday afternoon: "Am told by a source that there's a lot of momentum for Les Miles at #KU as the new head coach, and that he's emerged as a frontrunner." Athletic director Jeff Long announced Sunday that head coach David Beaty will not be retained next season but will remain on the sidelines for the final three games of 2018: at Kansas State on Saturday, at Oklahoma on Nov. 17 and home against Texas on Nov. 23. The Jayhawks are 3-6 (1-5 Big 12) on the season. Kansas hired Beaty, now 48, before the 2015 season. He has compiled a 6-39 record. That includes 2-31 in Big 12 games, 1-19 on the road and 2-2 against FCS opponents. He will receive a $3 million buyout. Long said Sunday a search for a coach would begin immediately, and college football insiders instantly speculated that Miles could be a good fit. He coached at Oklahoma State for four seasons (2001-04) and took the Cowboys to three bowl games. 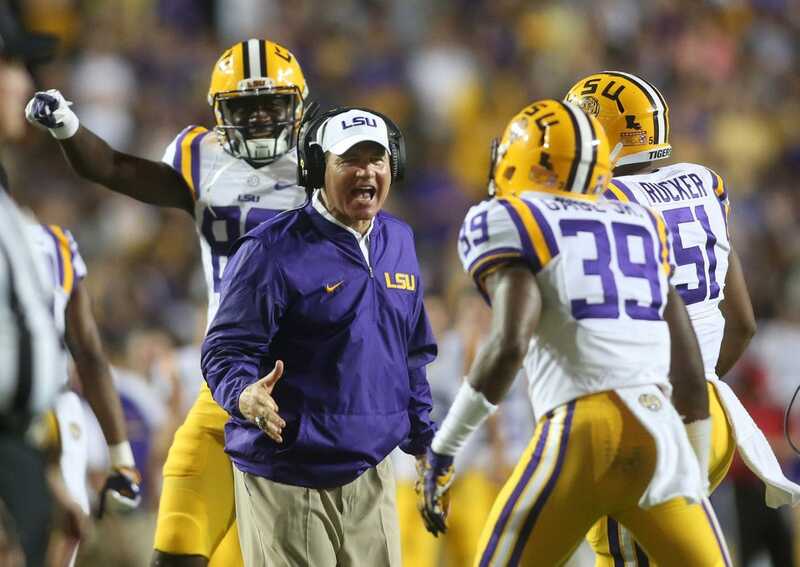 He put together a 28-21 record before LSU named him its head coach in 2005. He stayed there until he was dismissed early in the 2016 season and put together an impressive list of achievements: a 114-34 record, an appearance in a bowl game each season and a national title in 2007. Kansas, on the other hand, hasn't finished above .500 since 2008 and has a 23-94 record from the 2009 season to the present. "His connections are too obvious to ignore. He and [Long] worked together at Michigan as assistant coach and associate AD, respectively, from 1988-94. Miles has plenty of Big 12 experience having coached Oklahoma State from 2001-04. He would bring immediate credibility as a coach, recruiter and face of the program with no NCAA baggage. Miles, who turns 65 on Saturday, is interested, but there has been no contact between he and Long." Perhaps that has changed by now.